Este es el libro que te estabas buscando . 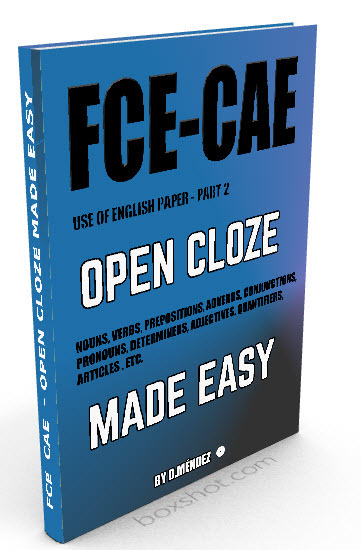 Te ayudará a aprobar la segunda parte del Use of English de los exámenes Cambridge , es decir el siempre dificil "open cloze test." Contiene explicaciones detalladas acerca de qué palabra utilizar y por qué , así como diferentes textos de muestra para practicar. This is the book that will help you pass the second part of the Cambridge Use of English test, i.e. the always difficult Open Cloze task. It contains detailed explanations and examples of why you should choose one word rather that another. Easy to understand grammar explanations with many examples , will help you understand the grammar behind every word choice. There are also very specific techniques and strategies that will allow you to avoid the most common mistakes students make on this part of the Use of Englishtest. CLICK ON THE PICTURE ABOVE TO DOWNLOAD THE PREVIEW OF THIS BOOK FREE OF CHARGE.